The plan was to send some production of the Utica and Marcellus shale from Ohio and Pennsylvania to distribution facilities on the Gulf Coast. But in a written statement calling it a plan ahead of its time, project lead-partner, Williams Energy said there was “an insufficient level of firm customer commitment” to go forward. Sure, and that happens. But what about the other factors? There was widespread and active push back against the Bluegrass plan from environmentalists and concerned citizens groups along its proposed route from western Pennsylvania, through northeast, central and southwest Ohio, to about half way across Kentucky. The most intense protests were in Kentucky. And a Circuit Court judge in Franklin, Ky., ruled that the pipeline builders could not use eminent domain to acquire easements on properties where owners did not want to allow the pipeline to cross. Bluegrass’s demise would remove the “financing, regulatory and execution risks” of the project, while it may lead investors to “question the security” of other Williams projects, said Christopher Sighinolfi, a Jefferies LLC analyst in New York. Williams had included the pipeline in its projections, while Boardwalk hadn’t, Sighinolfi said. Let’s see some analysts question the security of Williams’ Transco Hillabee Expansion Project, that first in the three-pipeline chain through Sabal Trail and FSC to the sea. Many analysts already are calling all fossil fuel stocks stranded assets. And the trendy Wall Street term for electric utilities that keep pushing fossil fuels instead of getting on with renewable solar and wind energy is “death spiral”. And that’s after analysts have been saying for a year that solar and wind are eroding the carbon bubble which is going to pop. It’s time for FPL to ditch the fracked methane ditch and get on with sun and wind. 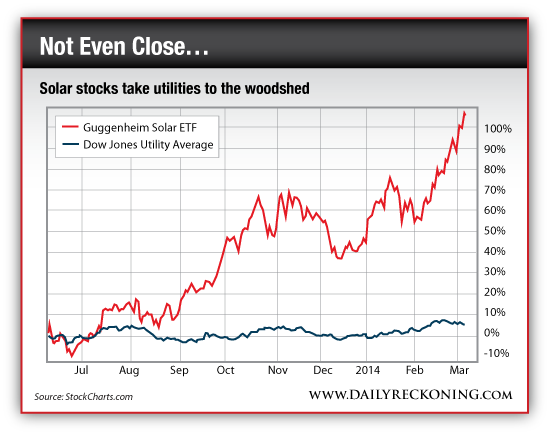 Look at those solar stocks skyrocketing while fossil fuel stocks stagnate….